Pennrich / Dresden | Felix Graf von Luckner Gesellschaft e.V. Felix Count von Luckner was born in Dresden on June 9, 1881, because his mother was not fast enough to come home for birth to the manor in Pennrich nearby. 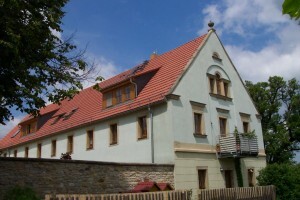 The family manor at Pennrich – here von Luckner grew up. In Pennrich little Felix grew up, since 2006 a memorial stone bears this in mind. The manor was bought by Auguste Lüdicke, who was from Hettstedt, which is located near Halle. Her daughter Marie married in 1880 Heinrich Count von Luckner, who at this time lived at Castle Altfranken nearby. The Count went to Pennrich to live together with his wife, and one year later Felix was born. Beside Pennrich for the later “Sea Devil” always a Halle on the river Saale was a home he always loved. Here his grandmother lived, took care of him. The manor was sold by his parents in 1897, who went to Halle themselves. The chapter Pennrich came to an end that time.